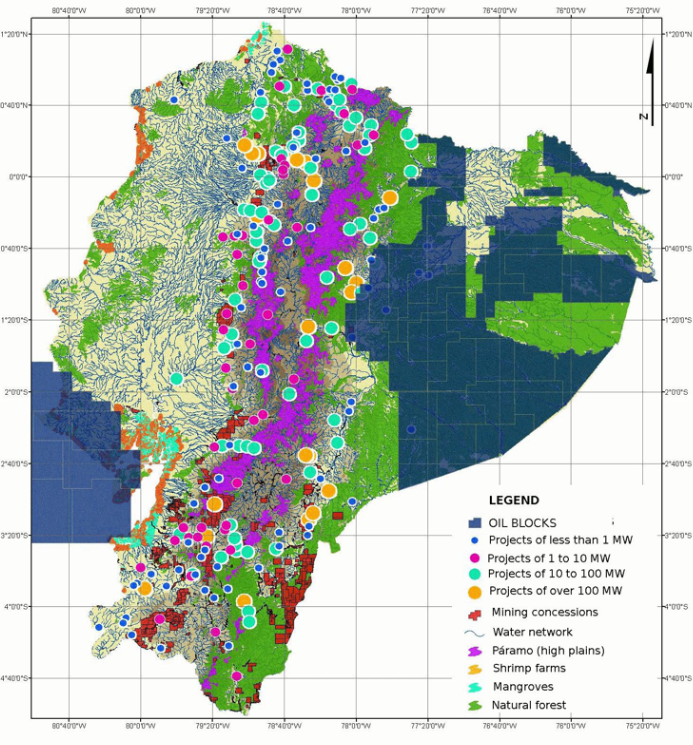 How should the costs of extractive activities be quantified? Assigning a price tag to the environmental damage is much harder than simply estimating the cost of cleaning up any spills or refill the kilometer-wide craters that would result from extractive activities. 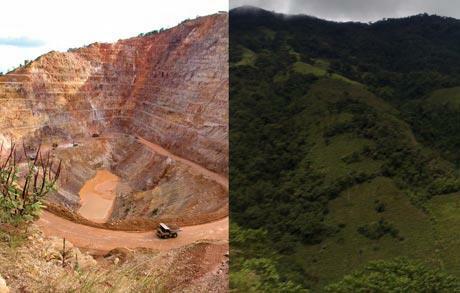 Just to give you an idea of how unrealistic any remediation plans are, Ecuacorriente, the local branch of the Canadian mining giant, has pledged a laughable 2.5 million dollars per year to rehabilitate the Mirador project area in Ecuador. This is outrageous considering the track record of mining rehabilitation: not a single mine has been adequately rehabilitated, not even in Canada. Not that any amount of money and effort is capable of putting back together an ecosystem that took millions of years to evolve, or truly compensate for people’s lives once they have been destroyed, but even if companies are legally obliged to provide proper compensation for damages, they might still not comply. This is the case of Texaco, now owned by Chevron. In Feb 2011, the oil giant was found guilty of dumping billions of gallons of toxic water throughout an area the size of Rhode Island. Chevron is legally required to pay 18 billion USD in compensation for their negligence, which decimated five indigenous communities and caused an outbreak of cancer and other oil-related diseases, threatening thousands of lives and permanently polluting their water supply and surrounding ecosystems. However, Chervon has no intention of recognizing this debt to the Ecuadorian people. What are some direct and indirect values of natural areas? Just because something doesn't have a price tag doesn't mean it has no value. Only a few (direct) values have been included in the human economy, and we have barely been capable of valuing anything which is not extracted from the enviromnent (Table 1). One way to begin to wrap our minds around the dilemma of valuing nature is through the tools of ecological economics. We can explore the value of healthy ecosystems by identifying the priceless ecosystem services they provide and imagining how much it would cost (if possible) to replace them. Although there are alternatives to extractivism, the monstrous scale and infrastructure supporting the fossil-fuel industry makes it difficult to envision an alternative. Nevertheless, the value of the services that these ecosystems provide to our lives and industries is no less real. These values can and should be included into the human economy. Rather than placing our bets on industries that are certain to reduce or eliminate these benefits altogether, we could develop infrastructure to quickly identify, quantify, and maximize their value, so as to include them in the human economy. This way all Ecuadorians, nay, Earthlings (and not just those who own these industries) can "profit" from them. Below are some of the most basic, and therefore economically important functions of natural areas. Watershed maintenance The paramos (see map above) are high-altitude grasslands whose soils act like a sponge and filter of water rushing down from the Andean mountaintops. These areas are a reservoir for lower watershed areas. They provide a useful and constant flow of filtered, low-sediment water to all the cities, industries and ecosystems that depend on them. No man-made reservoir and water treatment plant could ever provide the volume and quality of water provided by the paramos and their rivers, much less for free. Genetic reservoirs:86% of earth's species remain unknown. It has been estimated that there are between 250,000 and 300,000 species of flowering plants, of which only about 10% have ever been evaluated for their medicinal or agricultural potential. Rainforests in particular are known to have a higher chemical diversity (a side effect of being an evolutionarily highly competitive environment) than temperate forests, for example. The applications of what we have yet to discover from biodiversity are endless: agriculture, alternative fuels, medicines, alternative materials, as an inspiration for industrial, mechanical, architectural design, etc. As Paul Stamets said, considering that fungi have been found to be able to break down components from biological weapons, conserving forests should be a matter of national security. Supporting food independence: The Food and Agriculture Organisation of the United Nations (FAO) estimates that about 75% of the genetic diversity of agricultural crops has been lost in the last century due to the widespread abandonment of genetically diverse traditional crops in favour of genetically uniform modern crop varieties. In fact, three quarters of global food production is comprised by just 12 crops and five animal species. Genetic diversity is necessary for successfully adapting to changing conditions like pests, disease, and climate change. Healthy ecosystems are necessary to support pollinator and pest predator populations, as well as keep weeds in check. Without pollinators and pest predators, people have to pollinate crops by hand and use hazardous chemicals which are detrimental to the ecosystem as well as for both farmer and consumer. The costs keep adding up. Human health: Besides the health benefits of food, water, and shelter, biodiversity is a safeguard for human health, as both our physical and psychological health depend on on it. Medicinal components come from life (plants, fungi, microorganisms, and animals) and they need to be discovered before we can make a synthetic version. For example, roughly 119 pure chemical substances extracted from some 90 species of higher plants are used in pharmaceuticals around the world. Similarly, various mushroom species possess potent anti-microbial properties and antiviral activity against hepatitis B, herpes simplex, HIV, influenza, pox, and tobacco mosaic virus. Furthermore, some of todays most potent anticancerigenic medicines come from fungi. Studies have shown that our cognitive abilities are also greatly improved by exposure to nature and even that exposure to nature helps speed up recovery times for patients. Pollination, integrated pest management, carbon sequestration, oxygen production, nutrient cycling, water cycling, and climate stabilization are but some of the invaluable environmental services provided by natural areas. But if the benefits of focusing our economic activities away from extractivism don't convince you, the costs business as usual with them surely will. As Bill McKibben points out in his fantastic Rolling Stone article, "We have five times as much oil and coal and gas on the books as climate scientists think is safe to burn. We'd have to keep 80 percent of those reserves locked away underground to avoid [a temperature increase of about six degrees celsius]". After all, climatic instability is costly at every level, and creating an Earth unsuitable for human life is, to say the least, antieconomic. Table 1 source: Laverty MF, Sterling EJ, Johnson EA, 2003. Why is Biodiversity Important? Network of Conservation Educators and Practitioners (NCEP). Center for Biodiversity and Conservation of the American Museum of Natural History. Newer PostFiestas de Quito: Y sin los toros, quien somos?